This little guy is turning 9 tomorrow! It's Pull A Capuche, which isn't published any more. I looked online, to see if perhaps I could find a copy, to no avail. So, now it's time for me to work Mommy Magic. It's a simple enough sweater, fairly straight forward, with a dragon worked in intarsia on the front. I think I can handle it. Little Man REALLY liked the sweater, so I may search a little more for the pattern (as having it already written down would be easier to work) but if not, it's to the drawing board for me. 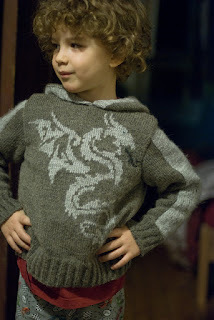 There are a bunch of double knit dragon scarf patterns on Ravelry. You might be able to use one of them, to save yourself the trouble of having to chart a dragon. Your son has great taste in knits!